2. 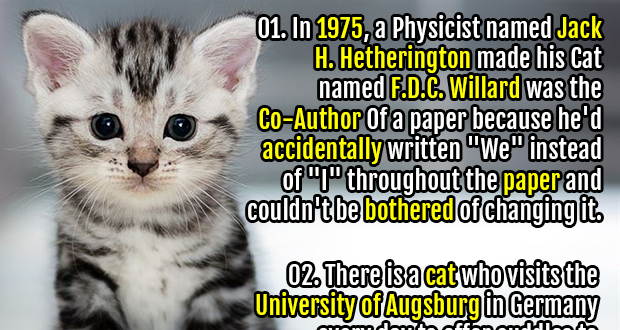 In 1975, a Physicist named Jack H. Hetherington made his Cat named F.D.C. Willard was the Co-Author of a paper because he'd accidentally written "We" instead of "I" throughout the paper and couldn't be bothered of changing it. 3. A cat named Tibbles once started bringing dead birds to a lighthouse that were discovered to be a new species, the Stephens Island wren. They went extinct shortly after and Tibbles the cat was accused of being the only single living creature to eradicate a species. 4. Jake Perry has been the owner of two consecutive holders of the record for oldest domestic cat ever. Creme Puff lived to 38 years old, the equivalent of 165 human years. 1/3 of Perry's cats have lived past 30. 5. Nancy Cowen was forced to leave behind her cat Cleo, whom she had adopted as a stray when she moved into a nursing home. About two weeks later, however, Cleo managed to find the nursing home where she is now reunited with her owner as care staff intends on keeping them together. 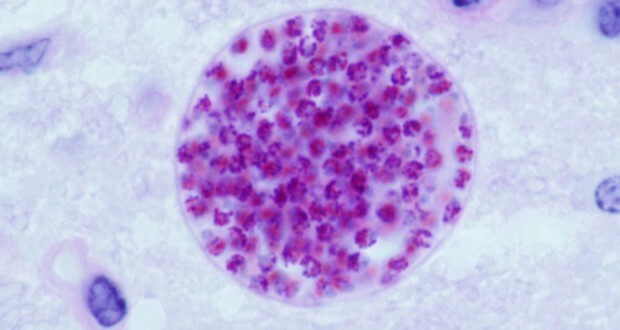 Toxoplasmosis Gondii is a brain parasite spread through cat feces, which slows rats, and causes attraction to cats. This parasite is transmissible to humans and can cause humans to excessively care for cats. Also, infected female humans (and rats) are more likely to find infected males attractive. 7. The world's most wanted hacker named Jeremy Hammond was himself hacked and arrested because his password was his cat's name plus '123'. 8. Cats are thought to be primarily responsible for the extinction of 33 species of birds. 9. A homeless heroin addict, James Bowen, got clean with the help of a stray cat, Bob, whom he found injured in 2007. James wrote a best-selling book, and in 2016 a movie was released starring Bob as himself. 10. Cat bites can be incredibly dangerous. Due to the fact that a cat's teeth are sharp and narrow, the resulting wound can heal over easily - resulting in bacteria trapped beneath the skin. A cat named Masha saved a baby's life. The long-haired red tabby found an abandoned baby in a box in the snow and climbed in to keep the baby warm and meowed to get the attention of a passerby. The abandoned baby was rescued unharmed. 12. Cat's kidneys are so efficient it can survive on a diet consisting only of meat, with no additional water, and can even hydrate by drinking seawater. 13. Unlike many other big cats, snow leopards are not aggressive towards humans. There has never been a verified snow leopard attack on a human being. 14. 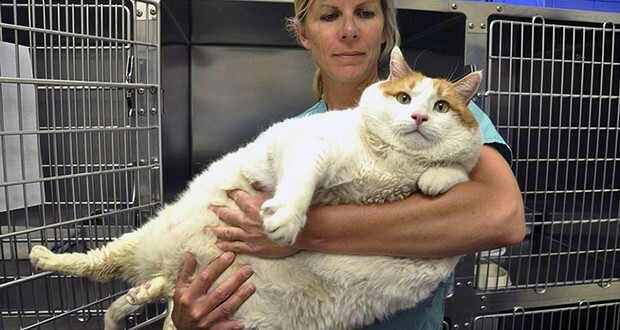 There is a cat who visits the University of Augsburg in Germany every day to offer cuddles to stressed out students. The cat's owner lives nearby and doesn't mind her daily excursions, and the students call her Sammy, the Campus Cat. 15. Sailors considered black cats good luck and would use them as "ship's cats" in hopes of a safe voyage. Wives of fishermen would also keep a black cat at home as it was believed that the cat would allow their husbands to return safely. 19. A Nova Scotia man broke into a ranch home, then fed the cats, did laundry, put out hay for the horses, took a shower, used the residents' toothbrush and shaver, and wrote in their diary. Cheetahs were almost wiped out by the last ice-age, and all modern cheetahs are descended from a small portion of the surviving cats that interbred to maintain their species. Because of this, cheetahs are practically genetic clones of one another. 22. Orlando, a ginger cat, competed and won against stock-picking professionals at the stock market. The cat picked at random, while the professionals used traditional stock-picking methods. At the end of the year, the cat had £542.60 profit, compared to the professionals' £176.60 profit. 23. Whenever a cat slowly closes its eyes and opens them again or winks at you, that means they trust you and recognize you as a friend. 25. A cat named Simon served on a Royal Navy ship in 1949 and received a medal for raising morale, killing off a rat infestation and surviving cannon shells during his service. Hundreds attended his funeral when he died from infected wounds. I don’t know why people adopt cats. They are needy, not rewarding and carry a lot of parasites, some of which are really harmful to the humans. They have in fact wiped out a lot of species in the United States due to their invasiveness. If you really need a companion, get a dog or adopt a kid. I actually adopted a cat once. He was a black cat and was awesome! He would fallow me around town as I walked my dog, he would snuggle with my dog at night and curled up in my lap when I was sick or watching tv. He was a very compassionate cat. I honestly believe he knew I adopted hm and rewarded me with love. It is really hard to decided which is better, cats or dogs. Also @Randall Murray, come on, they may have wiped out a lot of species in USA, but so have the humans. That doesn’t mean we have to wipe out humans. We adopt cats because we aren’t self centered jerks like Randall Murray.